The Crimean plebiscite resulting in a vote of over 95 percent in favor of union with the Russian Federation has been roundly denounced by Western governments as "illegitimate" and in violation of "international law." Putative presidential candidate Hillary Clinton went so far as to compare Vladimir Putin to Hitler and the Crimean accession to Russia to Germany’s conquest of Sudetenland in the run up to World War II – prefiguring, perhaps, her Amazonian approach to foreign policy in 2016. Twitter is ablaze with hyperbole of a similar tone, and the foreign policy pundits have been quick to take up the cry of "Putin the Aggressor." "The parallels seem pretty obvious: not entirely unlike Crimea, Kosovo was an autonomous republic with a majority of citizens that belonged to an ethnic minority. And the ethnic Albanians living in Kosovo feared Serbian repression, just as Russians living in Crimea feared the newly-empowered Ukrainian nationalists that has assumed power in Kiev." "But there is a difference: in Kosovo, the US was supporting a region that had declared independence a decade after suffering systematic abuse and painstaking negotiations for autonomy. Right now, Moscow and Washington are arguing over what is very much the jerry-rigging of a referendum on independence – despite no evidence of abuse, no opportunity for peacefully negotiating change, all in direct contradiction of international law." What is "abuse"? This is the key to Drezner’s argument, the others being merely quibbling over formalities (such as when Kosovo really become independent). One of the very first acts of the Ukrainian coup leaders after chasing out the duly elected government of Viktor Yanukovich was to outlaw the Russian language as an official "second language" in all regions of Ukraine, including the eastern Russian-speaking provinces and Crimea. Does this qualify as "abuse" in Drezner’s world? Well, perhaps not – but in Ukraine it is an entirely different story. Here, after all, is a region of the world where wars have been fought over language, where cultural identity means more perhaps than it does at Tufts University, and where the history of the region gives ethnic minorities good cause to fear violence at the hands of the majority. And what is this notion that there was "no opportunity for peacefully negotiating change"? When the "protesters" in the Maiden were on the verge of taking power, the Yanukovich government – doubtless in coordination with the Russians – signed an agreement with opposition leaders, mediated by the EU, that called for presidential elections by December, the reestablishment of the 2004 Constitution which severely limits presidential power, and the creation within 10 days of a "government of national trust." The February 22 agreement was broken, however, as ultra-nationalist protesters threatened to go on a "military offensive," in the words of one speaker in the Maiden, and violent squads of neo-Nazi skinheads affiliated with "Right Sector" – a paramilitary extremist organization – proceeded to take over government facilities in Kiev and across the country. Yanukovich was forced to flee. "Kosovars could point to a legitimate, documented trail of Serbian abuses before they declared independence. The US could point to United Nations Security Council Resolution 1199 (with Russia voting in favor) and note with concern "the excessive and indiscriminate use of force by Serbian security forces and the Yugoslav Army which have resulted in numerous civilian casualties. In contrast, Russia acted unilaterally in Crimea – and officially, the Russian government still denies that Russian troops are the ones controlling the territory." Kosovo was de facto independent many years before it officially declared its sovereignty, but that was only because the occupation forces of the NATO countries – which still patrol Kosovo to this day – forbade a formal declaration. "Liberated" Kosovo was in fact governed by the NATO allies, who set up an administrative apparatus to oversee the country: a heavy layer of bureaucracy that kept spinning its wheels long after it had outworn its welcome – and is still spinning many of those wheels today. Secondly, one has to wonder if the Russians living in Crimea had to wait until the ultra-nationalists in Kiev began their pogrom so they could then come up with "a legitimate, documented trail" of abuses before being allowed to take defensive measures. And let’s get back to what constitutes "abuse." Does the term include overthrowing the elected government by force – and subsequently threatening to ban a language spoken by the majority of Ukrainians? "Stepping back," avers Drezner, "the big difference between Kosovo and Crimea is that the US only took action after giving diplomacy numerous chances…. Russia, on the other hand, has chosen to occupy first and negotiate later. Cynics might argue that the outcomes have been the same. But process matters in foreign policy, and Russia’s process has been a shambles." Drezner is right that process matters: he is, however, quite wrong that the United States government has been facilitating such a process. Indeed, if we take seriously Victoria Nuland’s infamous intercepted "F – the EU" conversation with the US ambassador to Ukraine, the EU’s efforts to cement an agreement were definitely not appreciated by Washington. This isn’t "giving diplomacy numerous chances." Finally, the "process" didn’t start this year, or even the year before – Crimea has been negotiating with Kiev since the breakup of the old Soviet Union, trying to ensure local autonomy within the Ukrainian nation. An agreement was reached in the early 1990s by former Ukrainian President Leonid Kravchuk and the Crimean parliament, with the latter "suspending" its plans for a referendum on independence in return for modification of the law governing Kiev’s authority over the region. In reality, the Crimeans have been trying to play the diplomatic card since May 5, 1992, when they first announced their plans for a popular vote on Crimea’s fate. 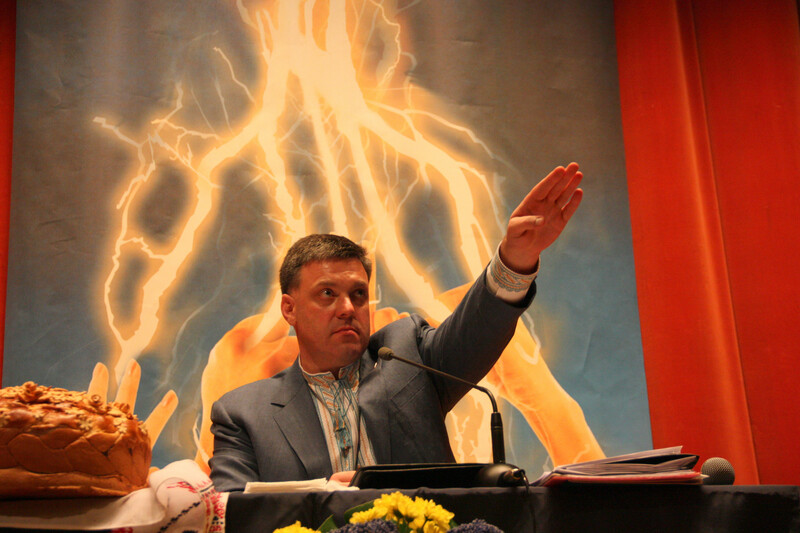 The vote was held in abeyance until the coup in Kiev empowered crazed ultra-nationalists – who took the first opportunity to destroy the Kravchuk accord. The Crimean people clearly fear their would-be masters in Kiev: they want out – and they have every reason to go their own way unmolested. Yes, "process" matters – but when fanatic nationalists want to ban your language and imprint their discredited ideology on the nation-state, then it’s right and just for Crimeans to take matters into their own hands. Previous Previous post: Why Is the U.S. So Hypocritical in Foreign Policy?